DEFA (Deutsche Film-Aktiengesellschaft) was the state-owned film studio of the German Democratic Republic (East Germany) throughout the country’s existence. The films in this online program deal with the longings of a generation that seeks fulfilment beyond the norms and conformist expectations of socialist society. The Goethe-Institut New York selected six important films for the DEFA summer film festival. Presented in cooperation with the DEFA Film Library at UMass Amherst. As mentioned elsewhere on this blog, East Germany was way ahead of the West when it came to feminist issues. Back when American women were still expected to stay in the kitchen and be good housewives, East Germany had women in nearly every profession. By the seventies over half the judges in the GDR were women. They were also better at bringing feminist issues to the big screen with films such as The Destinies of Women and Her Third. Even so, East German was as guilty as everyone else when it came to offering women the opportunities to make movies. This started to change in the seventies (but only slightly), with the introduction of directors such as Evelyn Schmidt and Iris Gusner, and writers such as Anne Pfeuffer, Gabriele Herzog, and Regine Kühn. Still, when it came time to make the very feminist film, Our Short Life (Unser kurzes Leben), the duties were handed over to a man. Whether the film loses anything for this choice is hard to say. It is filmed with a keen eye and great sensitivity, and certainly gets its message across. Our Short Life (Unser kurzes Leben) tells the story of Franziska, a young architect who is looking for meaningful connections in a world where few exist. She wants to make sure that her new buildings are an integral part of the community, and not mere Plattenbauen—those featureless high-rises common to East Germany that were erected to house workers as economically as possible. 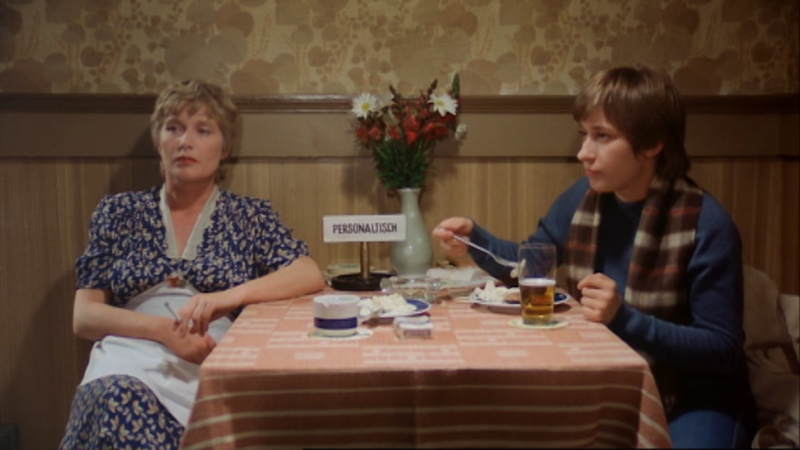 After hours, she hangs out at the local pub with its proprietress Frau Helwig, and tries to makes friends with the women in her rooming house, but finds it difficult due to the status and cultural differences that the state supposedly eliminated. Our Short Life is based on Franziska Linkerhand, a heavily autobiographical book by Brigitte Reimann. During the late fifties, Riemann was the darling of the East German literary scene, lauded by no less than Walter Ulbricht as one of the leading lights of the Bitterfelder Weg (Bitterfelder Way), a movement sponsored by the East German government to encourage socialist thinking in the arts. As time went on, however, Riemann followed same arc as many other East German creative people, growing increasingly disillusioned with the government’s betrayal of basic socialist principles in favor of an intractable band of authoritarians who brooked no dissent. Riemann died of cancer in 1973, and the book was published posthumously. After the Wende, it was found that some parts of the book, in particular its references to the Stasi, had been removed before publication. A restored version was published in 1998. Playing Franziska is Simone Frost, whose height at just over 5’ (1.53m) suggests that the film’s title has an additional meaning. The size difference between her and the rest of the cast is emphasized throughout the film, giving her battles against the powers that be a certain Jack the Giant Killer quality. Before the Wende, much of Frost’s non-theatrical work was on television, and the same held true after the Wende. Most notably, she was a regular on the long-running kids’ show, Schloss Einstein (Castle Einstein) on the KiKa channel (similar to Nickelodeon). Shortly before the Wall fell, she and her husband Hans-Joachim Frank, created Theater 89 as a place to put on plays that the state wouldn’t touch. The theater is still going strong today. Tragicallly, Frost died of cancer at the age of 51 in 2009. The rest of the cast is equally exceptional. Playing the level-headed Frau Helwig is Barbara Dittus, who is always a joy to watch. Franziska’s boss, Schafheutlin, is played by Hermann Beyer, brother to the East German film director, Frank Beyer. Franziska’s caddish love interest, Trojanowicz, is played by Gottfried Richter, who has done very little on screen since the Wende, preferring to work on stage (and who has the distinction of being one of the few East German actors who has not appeared on In aller Freundschaft). Playing Franziska’s office partner is Christian Steyer, who is best remembered as Paula’s caddish lover in The Legend of Paul and Paula. In a small role, playing Schafheutlin’s secretary is Christine Schorn, who has gone on to have a very successful career in unified Germany, and is best known to Western audiences for her turn as Frau Schäfer in Goodbye Lenin! Director Lothar Warneke’s road to becoming a director was more circuitous than most. He initially studied theology at the Karl Marx University in Leipzig, changing pursuits after the local vicar resigned. He got his first chance to direct as part of a team on Not to Me, Madam!, sharing directorial duties (but apparently not film stock) with Roland Oehme. Warneke achieved his greatest success for his 1987 film Bear Ye One Another’s Burdens. Two years later, the Wall came down and Warneke found it hard to get work after French and West German entrepreneurs dismantled DEFA and its film community. He then became a teacher at the film school in Potsdam-Babelsberg. Later, Kühn started writing and directing her own films, primarily documentaries. In 1994, she won the Deutscher Drehbuchpreis—a prize given for unproduced screenplays of merit—for Zarah L., her screenplay about the infamous Third Reich era singer, Zarah Leander. To date this film has yet to be produced. Our Short Life did well at the box office and garnered a few awards and nominations. It was also a hit with the East German critics, who were always happy to see a film that could discuss sensitive topics without getting shelved. If they thought this signaled a relaxation of the restrictions on sensitive film topics, they would have been wrong. It was only a few months later, the film review board would come down hard on Jadup and Boel. Next Post BuJazzO – Maria Baptist is fascinated by big cities. My experience is that the West tries to suppress feminism because without all the free labor women provide capitalism would collapse.